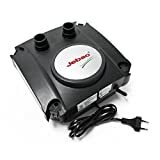 Suitable for use in aquariums, keeping and rearing tanks or small water features where reliable water conveyance, circulation or flow is required. Designed for submersible use only in salt or fresh water environments. Adjustable output up to 750L/H. Maximum head 1.5m. Power consumption 12w. Supplied with 2m of cable (UK plug). Recommended for indoor use. This compact pump is designed for use under water and it’s dimensions ensure it is easily installed in the smallest of spaces. Flow is adjustable. 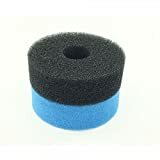 Replacement foam set for Jebao CF-10 / PF-10 and Bermuda 4000 Pressure Filters.